Are you preparing for your Practical Driving Test in 2019 but unsure of how to answer the Show Me, Tell Questions? We have the complete guide for 2019 here. During your Practical Driving Test, the examiner will ask you to answer two Show Me, Tell Me questions. These questions are normally asked at the start or at the end of the practical test in the test centre car park. The “Tell Me” questions are answered verbally by explaining the answer to the examiner, but with the “Show Me” questions you will need to carry out the check in full to show the examiner you understand the required check. In total there are 19 Show Me, Tell Me questions, but the examiner is restricted to a list of 12 possible combinations of questions that they can ask you on your test. Question: Show me how you would check that the direction indicators are working. Answer: Turn on the hazard warning lights and walk around the car to check that all of the indicator bulbs are operating. This test can also be carried out by using the indicator switch - but for this, the ignition must usually be on - and it is not recommended that you turn on the ignition unless you are sitting in the driver's seat. Answer: Before starting the engine, press the pedal: The brakes should not feel spongy or slack. After starting, and immediately after setting off and finding a safe place to do so, the brakes should be tested by applying them firmly. The vehicle should pull up smartly without pulling to one side. Question: Identify where the windscreen washer reservoir is and tell me how you would check the windscreen washer level. Answer: Identify the windscreen washer reservoir and explain how to check the level by looking through the lid or spotting the level through the plastic of the container. The windscreen washer bottle will usually have a lid that is marked with a windscreen symbol. The fluid in the bottle will usually be brightly coloured (Green, Yellow, Blue and Pink are all common colours for washer fluid). Question: Show me how you would check that the brake lights are working on this car (I can assist you, if you need to switch the ignition on, please don't start the engine). Answer: Press the brake pedal and either make use of reflections in windows, garage doors, or another parked vehicle or ask someone to help by standing behind the car as you press the pedal. Note that the brake lights of some cars do not work unless the ignition switch is on. Answer: If the steering becomes heavy the system may not be working properly. Before starting a journey two simple checks can be made. Gentle pressure on the steering wheel, maintained while the engine is started, should result in a slight but noticeable movement as the system begins to operate. Alternatively turning the steering wheel just after moving off will give an immediate indication that the power assistance is functioning. If the steering is very heavy - then the system has failed. Answer: The correct tyre pressures can be found in the manufacturer's guide (or in the vehicle handbook). Often they are printed on the inside of the fuel filler lid or inside one of the front door-frames. You should use a reliable pressure gauge, checking and adjusting the pressures when the tyres are cold. Don't forget to check and adjust the spare tyre’s pressure and remember to refit all of the valve caps. Question: Show me how you would check the parking brake (handbrake) for excessive wear, make sure you keep safe control of the vehicle. Answer: Demonstrate by applying the parking brake that when it is fully applied it secures itself and is not at the end of its working travel. i.e. the cable that the handbrake operates should be tight enough to prevent the car from rolling before the handbrake mechanism reaches the stop that prevents it from being moved any further. Answer: Before carrying out the check, ensure that the car is on level ground and that the oil has had time to settle. Locate and pull the bonnet release handle, raise and support the bonnet with the strut. Identify the dipstick/oil level indicator. Remove the dipstick and wipe. 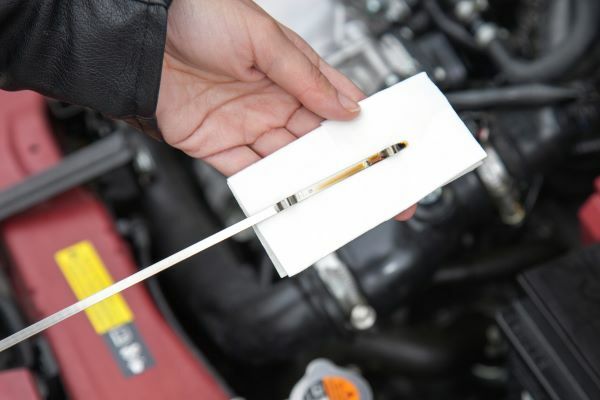 Replace the dipstick fully, remove a second time and observe oil level relative to the maximum and minimum markings. Question: Open the bonnet, identify where you would check the engine coolant level and tell me how you would check that the engine has the correct level. Answer: Identify the high/low level markings on the header tank (where fitted) or show how you would remove the radiator filler cap. Describe how you would top up to the correct level using either water or radiator coolant diluted to the correct level with water. Question: Open the bonnet, identify where the brake fluid reservoir is and tell me how you would check that you have a safe level of hydraulic brake fluid. Answer: Open the bonnet and secure it with the strut. Locate/identify the reservoir (it is usually a small plastic container attached to the engine bulkhead, and will contain an oil-coloured fluid). Check the fluid level in the bottle is between the high and low markings on the side of the translucent bottle. Question: Tell me how you would check the tyres to ensure that they have sufficient tread depth and that their general condition is safe to use on the road. Answer: There should be no cuts or bulges anywhere in the tread or in the sidewall and a minimum of 1.6mm of tread depth across the central 3/4 of the breadth of the tyre and around the entire outer circumference. A simple and cheap depth gauge can give an accurate measure of the tread depth. Answer: Check is carried out by locating the horn button and pressing it. Note that you should only carry out this check if it is legal for you to do so. Some cars do not allow the horn to operate unless the ignition is in the on position. Answer: The correct tyre pressures can be found in the manufacturer's guide (or in the vehicle handbook). Often they are printed on the inside of the fuel filler lid or inside one of the front door-frames. You should use a reliable pressure gauge, checking and adjusting the pressures when the tyres are cold. Don't forget to check and adjust the spare tyre’s pressure and remember to refit all of the valve caps. Answer: Before starting the engine, press the pedal: The brakes should not feel spongy or slack. After starting, and immediately after setting off and finding a safe place to do so, the brakes should be tested by applying them firmly. The vehicle should pull up smartly without pulling to one side. Question: Tell me how you would check that the headlights & tail lights are working (there's no need to exit the vehicle). Answer: Set all relevant controls including; fan, temperature, air direction/source and heated screen to clear windscreen and windows. The engine does not have to be started for this demonstration. Question: Show me how you would switch on the rear fog light(s) and explain when you would use it/them (no need to exit vehicle). Answer: Operate switch (turn on dipped headlights and ignition if necessary). Check warning light is on and explain use. Question: Tell me how you would check that the headlights & tail lights are working (No need to exit vehicle). Answer: Operate switch (with ignition or engine on if necessary), and check with the main beam warning light. Answer: Warning light should illuminate if there is a fault with the anti-lock braking system. Do you need more practical revision and would like an online solution? Take a look at our Online training revision materials to guide you through all the learning to drive essentials. Or, if you prefer to use an award-winning app, the Driving Theory Test 4 in 1 App has everything you could possibly need including an update to the Highway Code and our question bank. App users also have access to our exclusive offers area to save them money on specific purchases, and the app also includes our unique 3D Stopping Distance Simulator.